Download your complimentary copy of the whitepaper here! Petrochemical Update is a trading name of FC Business Intelligence Ltd. Simply fill in your details below for your copy of the EXCLUSIVE interview! SVP of DTE Energy shares all on Construction of Gas Power Plants in Exclusive Interview! As part of the run-up to the Gas Power Plant Engineering and Construction Conference (June 18-19, 2018), we interview one of our top confirmed speakers, Robert Richard, SVP Major Enterprise Projects, DTE Energy, on his top tips to a successful Gas Power Plant Construction Project - I hope you find it of interest. 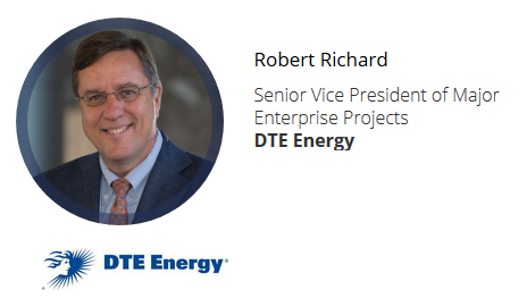 Robert Richard is senior vice president of Major Enterprise Projects for DTE Energy, a Detroit-based diversified energy company involved in the development and management of energy-related businesses and services nationwide. Richard is responsible for major projects in Power Generation, Distribution, Renewable, Nuclear and Gas Midstream platforms- including the $1Billion East China Township Natural Gas Power Plant Project in Michigan. This assignment leverages his experience as an operating Executive in Gas Midstream, Power Generation and the Gas Utility of DTE Energy. Robert will be delivering a case study at the conference on lessons learned in the early stages of DTE Energy’s own $1Billion Natural Gas Power Plant Constriction Project in East China Township, Michigan. Other major gas power plant owners and developers, like Duke Energy, Southern Power & Emberclear, will descend on Pittsburgh to drive transformative change in productivity, interoperability and performance for gas power projects - Will you be joining them? I hope you enjoyed the interview please let me know if you have any feedback.